All Whisky Lovers! 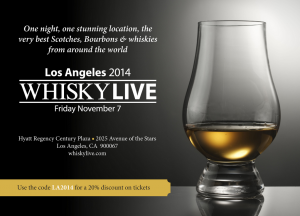 Whisky Live 2014 in LA this Friday! Whisky Live LA, now in its sixth year, will take place once again in the Hyatt Regency Century Plaza. Encompassing the magic of Hollywood and the grandeur/energy of LA and located between Beverly Hills and Santa Monica, it is the perfect setting for the premier whisky event on the west coast. Easy access from downtown, Hollywood and the suburbs, plus ample on-site and public parking make this the ideal place to host the largest and most diverse whisky tasting in California. Whisky Live LA offers a fantastic evening of the finest whisky, incredible whisky cocktails, great food and entertainment – making enjoying whisky part of a lifestyle! The admission ticket is all inclusive. Use code LA2014 for 20% discount. It includes a souvenir Glencairn tasting glass, leather bound tasting journal, show brochure, full dinner buffet, live entertainment and access to the whisky sampling event. We no longer have tasting vouchers, so you are not limited to a certain number of samples. We do ask that everyone sample responsibly and we reserve the right to remove anyone from the event that is not doing so. Buffet on offer from 6pm to 9pm. After all, fine whiskey is best enjoyed with great company. 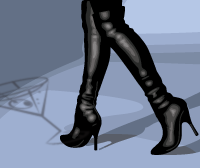 Over 150 different expressions to choose from! ADMISSION TICKET: (5:30-10pm) includes souvenir Glencairn tasting glass, leather bound tasting journal, show brochure, full dinner buffet, live entertainment, and access to whisky sampling event. Funds collected in US dollars. TICKET PRICE: $129 USE CODE LA2014 for 20% discount.